Last week we focused on the “elite” heavyweight fighters and in an ever-changing division with contenders coming and going, this article seeks to take a look at the next crop of challengers looking to force their way to a world title. Where better a place to start than with the man who will challenge Anthony Joshua for the WBA, WBO, IBF and IBO world titles on September 22nd – Alexander Povetkin. Now if this was written three, four years ago then Povetkin would easily walk into your top 5 on any given day but a whole range of factors have seen his profile and, indeed, fear-factor cascade down. Obviously part of that is due to his failed drugs test which, rightly or wrongly, cast a shadow over all performances both past and future and if we’re being honest the Russian superstar looked slow and lacklustre in his two fights of 2017 – namely against Christian Hammer and Andriy Rudenko – whilst against David Price on March 31st of this year he showed fragility when Price gave him a major scare in the third round. That’s the negativity out of the way with, then, we can now focus on the positives which is, to be frank, that Povetkin is an absolute animal in the ring and despite that scare against David Price he also showed a killer instinct to get the job done in the fifth with one of the most brutal knockdowns of recent memory. His power is frightening as too, by the way, is his icy, steely persona which remains seemingly unfazed during conflict, and that emotional detachment from the sport, his job, is something that is quite scary but clearly plays into his favour because, in a way, he does treat this like a job and it’s just something he needs to get done. And boy he doesn’t half do it well. “Big Baby” Miller, next on our list, is, well, a huge lump of muscle and one huge brawling machine. That’s not to do him any disservice because it’s got him the results he needs – against Gerald Washington back in 2017 he took his American counterpart to town in a brutal beatdown that lasted eight rounds whilst against Mariusz Wach he exhibited his sheer power in exploding the Polish veteran out of the ring in the ninth round. Of course this come-forward, swing at all costs, style of fighting has it’s downsides as does, evidently, weighing near 300lbs so the natural to criticism to levy his way is that he’s not that great a mover and he’s open to get hit and, true as that may be, I’ve been impressed with his opening explosivity and hand-speed although, naturally, he does fatigue an awful lot quicker than his nearest rivals. Undeniably being lined up to face Anthony Joshua, Miller signed with Eddie Hearn and Matchroom USA recently and has already been making noises with regards that fight, appearing at the DAZN press conference and getting under the skin of AJ already (as scripted as it looked). Next out on October 6th, Miller is at the stage of his career where he needs to fight legitimate Top 15 contenders – Carlos Takam is a name that comes to mind – in order to prove that he’s more than first impressions would suggest and really catapult him into the top brass of this division. The ageing Cuban who, for a long time, has been heralded as the purest heavyweight in the division knows that time is against him with the 39 year old knocking on the door of a world title for the last time. A former interim WBA World Heavyweight champion, the power of the Cuban is undeniable – as we saw in back-to-back destructions of Martias Ariel Vidondo, Bryant Jennings and Tony Thompson in a five month period between October 2015 and March 2016. Since then we’ve seen Ortiz look stale when up against Malik Scott and David Allen, his two fights under the promotional banner of Eddie Hearn, but in contrasting fashion his fight against Deontay Wilder in March re-established himself as a threat – it was do or die throughout the fight for Wilder with many seeing Ortiz as leading on the scorecards prior to the stoppage (though Wilder was officially ahead by 1point on all three). Twice having failed drugs test since 2015 there will always be those who raise eyebrows when his name is mentioned but a fiery salvo in the seventh round against Wilder was all you need to see to know, “yeah, this guy’s got it”. Not instinctively fast, when King Kong turns it on then, trust me, it is ON and, like a switch, he can become dynamism personified for the round as he piles the pressure on. In need of the big fights, Ortiz is a man who looks infinitely more polished and threatening when in with a better calibre of opposition and relies on 12 rounds (or less) of fighting as opposed to a nuanced tactical battle. Take his fight with Anthony Joshua away from his CV and it’s easy to forget that Joseph Parker was actually WBO heavyweight champion of the world with thanks to a uninspiring victory over Andy Ruiz followed by, equally uninspiring defences, against Razvan Cojanu and “Shades of Ali” Hughie Fury. Nonetheless he was the world champion and the first man to take Anthony Joshua to task for a full 12 rounds so we shouldn’t be overly critical and the Kiwi, unlike Ortiz, is a man that needs to have a careful, controlled fight to enable him to work the body and get his footwork into play. At least that’s what we thought until he got in the ring with Dillian Whyte in a fight that, whilst still not superfluously impressive, answered a few questions with regards David Higgins’ poster boy – for the first time in a long time we saw the power that Parker packs as he rattled Whyte, dropping him in the process, and rallied for an absolute barnstormer of a final two rounds. Questions answered but, simultaneously, questions raised. Namely, why on earth does Parker not show that heart, conviction and sheer fire throughout the whole fight instead of saving it for a final flurry? Only he knows the answer to that but it showed the fans that he’s certainly a class act and not someone that anyone is going to go out of their way to fight – except Whyte, of course. The next fight is key for Parker, a win is a necessary must for him to get back into title contention. The hardest man in boxing? Old school hard, that is. A man you wouldn’t want to meet in the back alleys of Newport on a blustery Sunday night. And that’s what makes him such a threat to this current crop of heavyweight challengers because you can never write Chisora off. Sure he has his bad days, need we mention Agit Kabayel? But he outnumbers those, by a significant handful, with stellar fights against the likes of Dillian Whyte and, more recently, Carlos Takam. 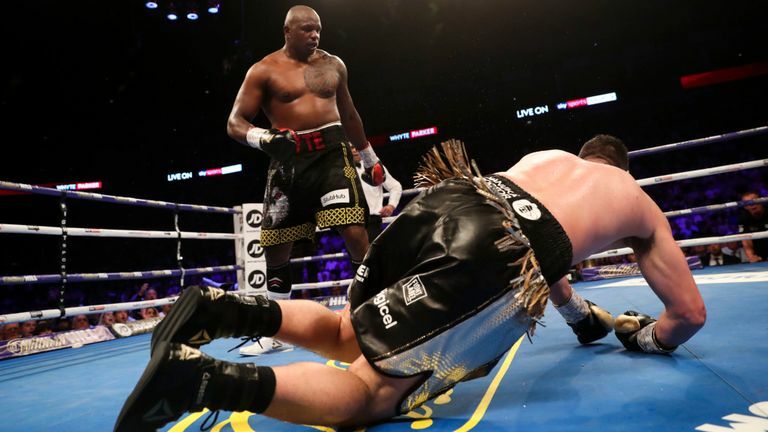 That Takam fight, let’s be clear, wasn’t all Dereck, either, but he looked cool, he looked breezy and he finished the job with a scintillating knockout in a fashion that made Anthony Joshua’s victory over Takam look, well, mediocre. That’s another thing about Del Boy, you can’t really attempt to analyse him in too much detail because his style is, in the nicest way possible, get stuck in, throw some punches and get the hell out of there as quickly as possible. Not a brawler, for that term has so many negative connotations, but a perfectly executed FIGHTER. Rumours murmur that he could be in the pipeline for Joshua, a $5million offer has been made to Deontay Wilder but Chisora has options for the more immediate future – a lucrative rematch with Dillian Whyte, a WBA Regular shot at Manuel Charr, maybe even Tony Bellew, who knows, but the point is that the future is looking as bright as I can remember for Steve Goodwin’s fighter and, good god, the ride promises to be exciting!